SAN DIEGO (AP) — It’s not only drones and driverless cars that may become the norm someday — ocean-faring ships might also run without captains or crews. The Pentagon on Monday showed off the world’s largest unmanned surface vessel, a self-driving 132-foot ship able to travel up to 10,000 nautical miles on its own to hunt for stealthy submarines and underwater mines. 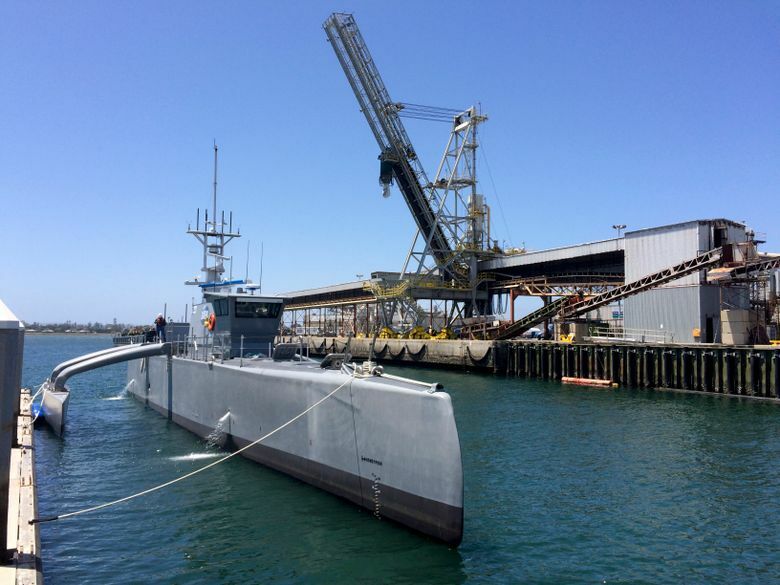 The military’s research arm, the Defense Advanced Research Projects Agency, or DARPA, in conjunction with the Navy will be testing the ship off the San Diego coast over the next two years to observe how it interacts with other vessels and avoids collisions. Unlike smaller, remote-controlled craft launched from ships, the so-called “Sea Hunter” is built to operate on its own. 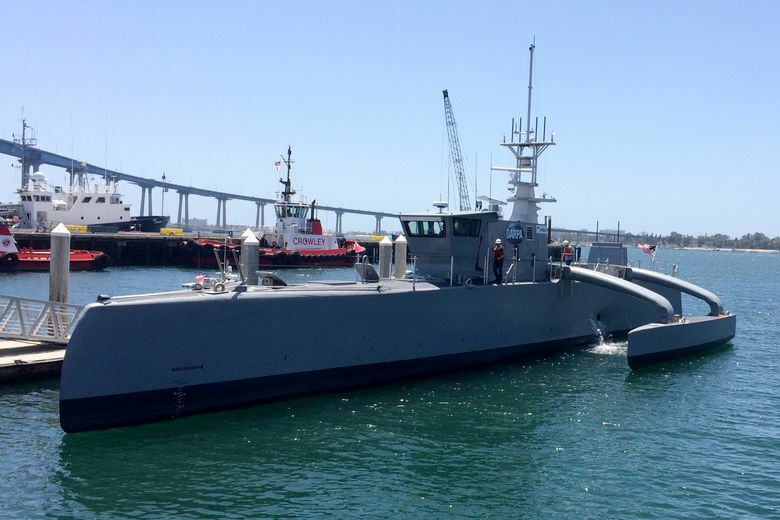 “It’s not a joy-stick ship,” said DARPA spokesman Jared B. Adams, standing in front of the sleek, futuristic-looking steel-gray vessel docked at a maritime terminal in the heart of San Diego’s shipbuilding district, where TV crews filmed the robotic craft. “Sea Hunter” relies on radar, sonar, cameras and a global positioning system. Unmanned ships will supplement missions to help keep service members out of harm’s way, Adams said. Besides military leaders, the commercial shipping industry will be watching the ship’s performance during the trial period. Maritime companies from Europe to Asia have been looking into developing fleets of unmanned ships to cut down on operating costs and get through areas plagued by pirates. During the testing phase, the ship will have human operators as a safety net. But once it proves to be reliable, it will maneuver itself — able to go out at sea for months at a time. With its twin diesel engines, it could go as far as Guam from San Diego on a mission, developers say. There are no plans at this point to arm it. “There are a lot of advantages that we’re still trying to learn about,” program manager Scott Littlefield said. The idea in the commercial sector has sparked debate over whether it’s possible to make robotic boats safe enough. The International Transport Workers’ Federation, the union representing more than half of the world’s more than 1 million seafarers, has said it does not believe technology will ever be able to replace the ability of humans to foresee and react to the various dangers at sea. Others have expressed concern about hackers taking control. Military officials have been working on hacker-proof protections and say it’s possible to make ships cyber-secure. The “Sea Hunter” was built off the Oregon coast, and it moved on a barge to San Diego’s coastline. The prototype can travel at a speed of up to about 30 mph and is equipped with a variety of sensors and an advanced optical system to detect other ships. The program to develop the ship cost $120 million, though DARPA officials say the vessels can now be produced for about $20 million.